Jesus answered, "Those who drink this water will get thirsty again, but those who drink the water that I will give them will never be thirsty again. The water that I will give them will become in them a spring which will provide them with life-giving water and give them eternal life." "Sir," the woman said, "give me that water! God accepts sinful, shame-filled, separated people. "When it comes to times of stress, the most reassuring companion you can have is your dog. A study has found that people who were under stress showed the least amount of tension when accompanied by their dog". "I think that dogs are non-judgmental, and they love us and they do it without any conditions", said a research scientist at a medical school. In a hospital I regularly visited in another parish, there was one ward that had lot of long-term patients. This ward had its own pets including a black Labrador (especially trained to be in a hospital situation). The dog would roam around the ward going from one person to the next. He enjoyed the pats and cuddles, even though sometimes a hug was a bit tighter than he would have liked. He didn’t care how old, or how crippled the person was, how much they dribbled or if their speech was blurred as they called his name, or how much their hands shook as they reached out to him. Throughout the day, he simply went to each person one by one and gave the patients so much pleasure as they watched him wander around the ward or curl up for a while at their feet. When I first saw a dog in the ward, I expressed my surprise and a nurse commented that since the dog had arrived there had been a drop in the level of stress and there was a greater calm among the patients. There is something very biblical in the assertion that non-evaluative love, non-judgmental love, unconditional love reduces tension. A Samaritan woman had come to a well in the heat of the day. She had come alone. She had been married 5 times, and 5 times she had been shown the door by her husband. Remember that in the culture of the time, it was the husband who divorced his wife – the wife had no say in the matter. Now she was living with a fellow who wouldn't even marry her. I could easily imagine that her self-esteem was at an all time low. She had failed 5 times in marriage. She may have thought that there must be something seriously wrong with her that 5 different men have seen it fit to divorce her. She is with another man now. She dare not marry him but she needed a man because a woman had so few rights in her day. Without a man, she would be out in the cold and be forced to either become a prostitute or beg in order to survive. As often happens the victim often gets the blame and the gossiping and snickering of the local women would not have helped her image of herself at all. None of the other women would associate with her. They simply looked the other way if they met her in the market place. Perhaps that’s the reason she didn’t come to the well first thing in the morning when the other women did. She wanted to be alone. She didn’t want to be hurt any further. When she came to the well, there was a Jewish rabbi sitting there. He was the last person she wanted to see. The Jews looked down their noses at the Samaritans – they were considered half-breeds and heathen. Back in history, the Jews in the north had intermarried with the Persians and had mixed a lot of the heathen Persian religion with their own. The Jews were quick to put down and criticise the Samaritans. When she saw the Jewish rabbi I would suppose that she intended to fill her jug and get away from there as quickly as possible, hopefully before he could say anything nasty to her. Jesus is the first to speak. He asks, "Could you please give me a cup of water?" She couldn’t believe her ears. She was a woman. He was a man. Jewish men never spoke to strange women in public. He was a Jew and she was a Samaritan. Jews never drank or ate from anything a Samaritan had touched. She was a failure morally and spiritually, a sinner. He was a holy man who spoke kindly and pleasantly. He goes on to talk about "life-giving water". "Those who drink this water will get thirsty again, but those who drink the water that I will give them will never be thirsty again. The water that I will give them will become in them a spring which will provide them with life-giving water and give them eternal life" (John 4:13,14). Here was this person considered a failure by herself and others – a failure in marriage, rejected by others, immoral, spiritually inferior, and a woman – and Jesus knows all about her life-style and what is happening in her life. He may not agree with her defacto relationship but he accepts her as a person. 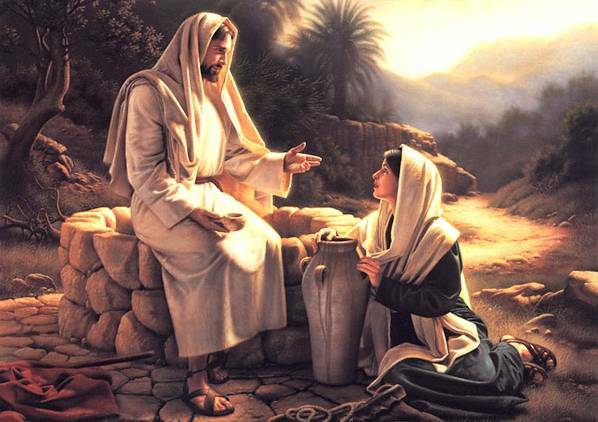 He not only talks with her but also offers her water that is "life-giving water" - water that gives eternal life. Not only is the woman surprised but so were his disciples. In fact, you might say they were shocked. Jesus was breaking every rule in the book. But Jesus didn’t care about the rules. All he was concerned about was this woman who was carrying a heavy load – a load of sin and failure that was weighing her down. All he was concerned about was that she needed to hear the good news of forgiveness and eternal life. It might be added, the Holy Spirit is a gift that comes with this "life-giving water". It is the Spirit who will open her eyes to see who Jesus really is – the Saviour who gives life and salvation. Jesus is providing a valuable lesson through this encounter at the well. He is teaching his disciples that even Samaritans can be saved and if Samaritans can be saved so can Romans, Greeks, tax collectors, prostitutes, thieves and all those we wouldn't normally associate with because of their suspect morals and way of life. If Jesus is able to reach out to a woman like this, he will also reach out to sinners of every kind – including you and me. Jesus accepts sinful, shame-filled separated people. In fact, Jesus has gone out of his way, into enemy territory, to meet the woman at Jacob’s well and to give her as an undeserved and unasked for gift, the good news of eternal life. The gospel writer, John, has told us this story to give us another glimpse at what kind of person the Messiah is. As the conversation goes on, the woman at the well states that she believes the Messiah will come and reveal all things and it is at this point Jesus says, "I am he, I who am talking with you". Through Jesus, we get a picture of what God is like. God accepts sinful, shame-filled, separated people. God sends his Son into enemy territory, into the sinful and separated world, so that we could receive forgiveness and eternal life through the death of his Son even though we don’t deserve it or have asked for it. From this one conversation with one woman, a whole Samaritan village is exposed to the truth. It might be said that it’s a relatively easy thing to talk to one person who is regarded as off beat, an enemy, strange, different and undeserving but to stay for two days – living in their homes, eating their food – that’s something quite different; something unheard of for a Jew to do. This story of Jesus and the woman at the well has many facets to it. The more you look at it, the more you see different themes and emphasise. But today let’s stick with the idea that Jesus came to seek and to save the lost. Jesus came to the woman even though she was upset and distressed about her own self worth; he came even though her faith in God was confused and muddled. She didn’t even grasp what Jesus was talking about when he spoke of "life-giving water". Can you see what is happening here in this Gospel story? Jesus knew her all right – her gender, her religious attitudes, her nationality, the history of her marriages, her living together with a man who was not her husband – her knew all this and yet he treats her as if she were an equal, as if she was a person worthy of respect, worthy of affection. isn’t it great to read a story like this one about Jesus and his love and acceptance of the woman at the well. We may not think much of ourselves, but Jesus thinks all the world of us. We may not have anyone to turn to in this world, but rest assured that Jesus is there to warmly accept us and help us to see that he will give us the strength and the power we need to overcome whatever it is that is grieving us. The good news is that he takes the first step, initiates conversation. He comes to us so that we might come to him. As I said before, the way Jesus treated the woman at the well was a good lesson for his disciples that would be helpful when they carried on Jesus’ ministry. When we encounter people who are different in some way, this story reminds us to not be so quick to judge but to reach out to them with the love of God. This is the season of Lent. Lent is that time in the year when our thirsty souls see Jesus, and receive living water. "Drink this living water," Jesus says, "And you will never be thirsty again".